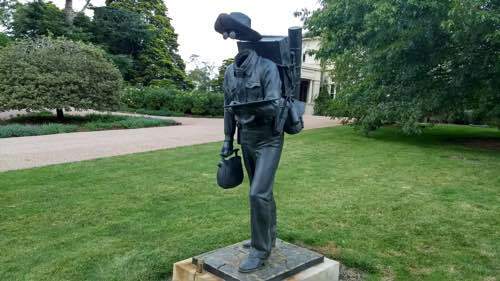 The Greg Poppleton 1920s-30s trio played for a wedding in the garden at Hopewood House, Bowral. The thunder rumbled but the rain stayed away for a beautiful ceremony and reception. 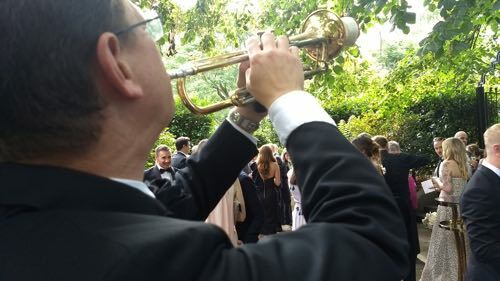 Greg Poppleton serenaded guests with songs from the 1920s and 30s selected from the Greg Poppleton play list by the bride and groom. Songs chosen included Begin the Beguine, Cheek to Cheek and Falling in Love Again. The Greg Poppleton trio at the wedding reception. Greg Poppleton with red 1920s megaphone and vintage microphone. Geoff Power sousaphone and trumpet. Grahame Conlon guitar and banjo. 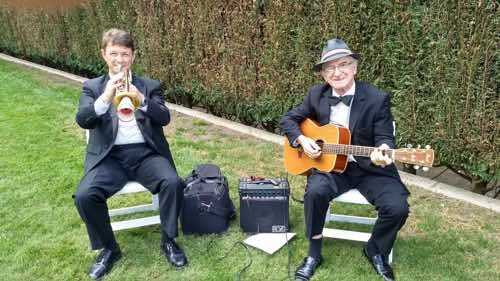 The Greg Poppleton duo playing the bride and groom's 1920s-30s jazz requests before the ceremony. Geoff Power trumpet. Grahame Conlon guitar. 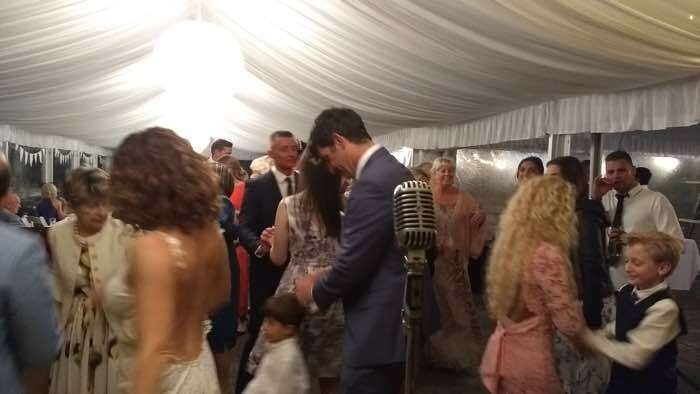 The view of the garden reception from the vintage 1920s microphone. Geoff Power trumpet. 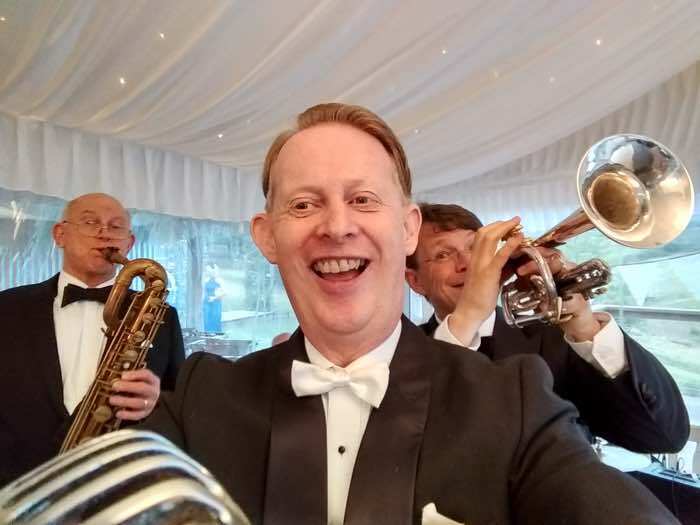 Saturday night and Greg Poppleton was singing the songs of the 1920s and 1930s with his band at Simon and Aleis' beautiful at Bush Bank. Bush Bank is an old dairy farm on the coast just south of Kiama, two hours drive (or train + walk) from Sydney. 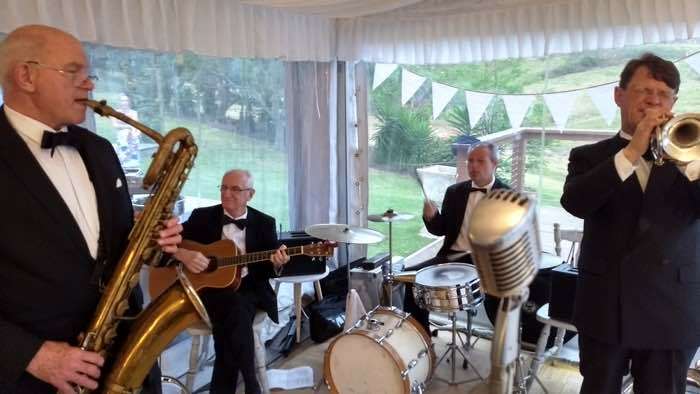 Having a live 1920s - 1930s jazz and swing band can make a fantastic difference to your wedding. Having Australia's only authentic 1920s - 30s singer and band gives you the biggest emotional impact. Dancing to Greg Poppleton and his 1920s - 1930s band at Simon and Aleis' perfect wedding, Bush Bank, Kiama. The Illawarra is famous for its giant Port Jackson fig trees (and Cabbage Palms). The area was once a rainforest. 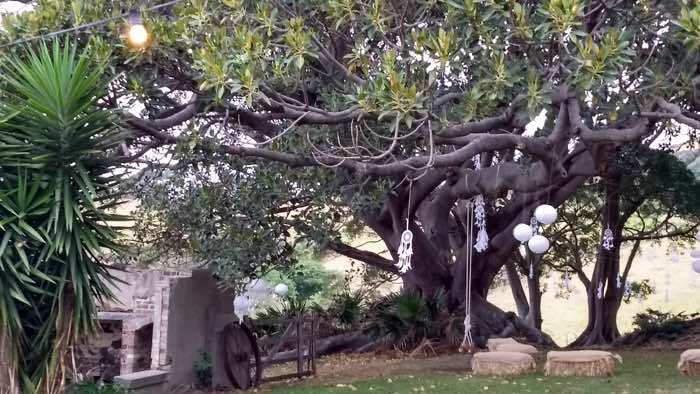 The big wedding fig tree at Bush Bank. Greg Poppleton's band of red hot 1920s-30s jazz musicians. (L-r) Glenn Henrich soprano, alto, baritone sax, clarinet and piccolo, Grahame Conlon guitar and banjo, Adam Barnard drums and washboard, Geoff Power trumpet and sousaphone. Greg Poppleton is Australia's only authentic 1920s-30s singer. Left, Glenn Henrich baritone sax. Right, Geoff Power trumpet. Set to music from Greg's latest 1920s-30s album Back In Your Own Backyard. In the band video below, I filmed the crashing waves about a year ago just where you see the white breakers in the picture above. Enjoy the 1914 hit, 'They Didn't Believe Me' by the Greg Poppleton 1920s vocal, guitar and clarinet trio in a contemplative mode. The song is from the band's album Back In Your Own Backyard, available from Bandcamp, CDBaby and iTunes. And here's the band playing 'Yes, We Have No Bananas', also from the album 'Back In Your Own Backyard'. 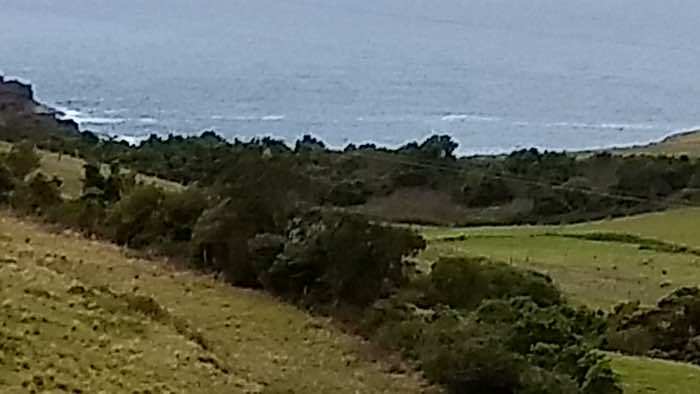 And the film was also taken just over a year ago and just at the back of Bush Bank along the Kiama - Gerringong bush walk. Enjoy!